Introduction to a Process for Schools to become more safe and supportive. The goal of the self-reflection process outlined in this document is to catalyze a reflective and creative inquiry-based, year-long or multi-year process to create and enhance a school’s work to become more safe and supportive for the entire school community (including but not limited to: students, staff, families, and community partners). This process enables schools to identify their most pressing local priorities and create action plans that can be incorporated into School Improvement Plans to address these priorities. When taken on by multiple schools in the same district, this work can also inform and enhance district improvement plans. What is a Safe and Supportive School? (ii) integrates services and aligns initiatives* that promote students` behavioral health, including social and emotional learning, bullying prevention, trauma sensitivity, dropout prevention, truancy reduction, children`s mental health, foster care and homeless youth education, inclusion of students with disabilities, positive behavioral approaches that reduce suspensions and expulsions and other similar initiatives. *Other related initiatives may include but are not limited to LGBTQIA (lesbian, gay, bisexual, transgender, queer or questioning, intersex, and asexual) alliances or other similar groups, inclusion of English language learners, substance use prevention and recovery, and more. The Safe and Supportive Schools Commission and its partners reviewed research, interviewed experts from Massachusetts and around the country, and consulted with parents and students in order to uncover common themes and essential characteristics from many initiatives that are foundational to creating a safe and supportive school. 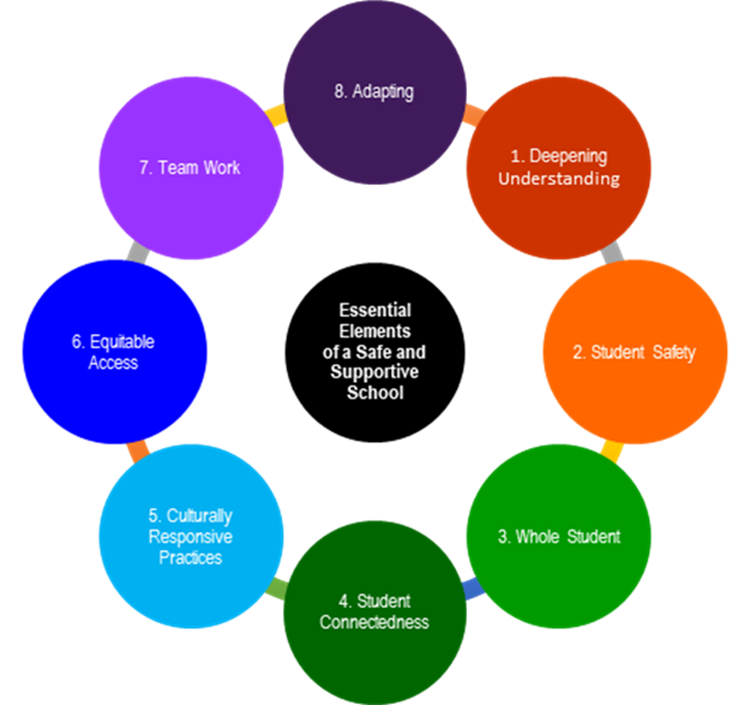 We refer to these cross cutting themes as the “Essential Elements” of a safe and supportive school. While every school is unique and no two schools will create a safe and supportive learning environment in exactly the same way, these Essential Elements are foundational through any and all schools’ initiatives. Continuously reflecting on the Essential Elements while using the four phase process described below in this document helps staff to develop an increasing familiarity with what a safe and supportive school is, evaluate their current school’s status, and create an action plan that identifies their priorities and establish a vision of what safe and supportive means for their school. 1. Deepening administrator/staff understanding of the need for a safe and supportive schools and the need for a whole school approach that values the expertise of educators and includes the voices of students and families. 2. Supporting all students to feel safe-physically, socially, emotionally, behaviorally and academically. o experience physical health and well-being. 4. Explicitly connecting students to the school community and providing them with multiple opportunities to learn and practice newly developing skills. 5. Building staff capacity to develop culturally responsive practices that dismantle implicit biases and systemic inequalities in order to create learning environments that welcome, include, and support all students to deeply learn, grow, and thrive. 6. Promoting equitable access, opportunities and outcomes for all students to ensure they are engaged and challenged to achieve their fullest potential. 7. Supporting the school staff’s capacity to work together as a team with a sense of shared responsibility for every student. 8. Helping the school staff assess and adapt to the ever-changing needs of students and the surrounding community. Creating an environment where all students can be successful requires that staff infuse these Essential Elements into all the activities of the school, both at the school-wide level and at the level of individual and group services. This includes academics, bullying prevention, drop-out prevention, social skill development, positive discipline, truancy prevention, and more. Even many school-wide programs related to positive discipline or social emotional learning do not always connect to or reinforce one another or do not become embedded in the culture of the school. Many important initiatives that could make a school safe and supportive often remain stand-alone programs or in competition with one another for resources. For this reason, the Massachusetts legislature called for a tool that could help integrate these many initiatives. As described in the process outlined in this tool, reflecting on school operations, programs, and practices using the Essential Elements as a lens can allow school staff to find new ways to make the existing initiatives mutually reinforcing and integrate services to better meet the multi-faceted holistic needs of children. For example, one Massachusetts school was able to align its work on trauma-sensitivity with its work on positive behavior supports through deepening its understanding of the importance of helping students feel safe. Staff recognized that the practice of using behavior charts with clips that are moved to reflect students’ current status as having “good” or “bad” behavior, tracked on a board at the front of the class, was a potentially humiliating experience for some students. By reflecting critically on the element of student safety, the staff modified its practice instead to teaching students to internalize the concepts of self-regulate using the Zones of Regulation strategies. This new way of addressing behavior aligned the goal of teaching students the skills of self-regulation (positive behavior, social emotional skills) with the goal of creating classroom spaces that are safe (trauma-sensitive). Importantly, students were better able to remain in the classroom. This is just one of many examples of how the Essential Elements can help make initiatives compatible with each other.